​Nasal irrigation kits are designed to relieve sinus congestion caused by sinusitis, allergies, cold and flu, dry air, work-place pollutants, hay fever, and more (Source). All without taking drugs with their undesirable side effects (Source). These nasal rinse systems are considered a safe and powerful means of cleaning out your nose- helping you sleep better at night, even improving your mood and relationships (Source). Essentially, the battery, electric or manual options we examined gently push saline through your nose, clearing and removing blockages (Source). 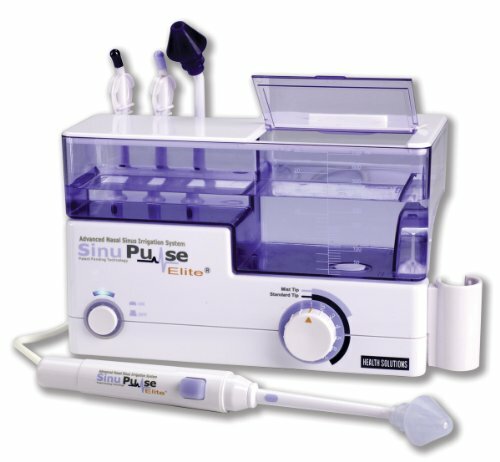 The Navage and NeilMed Sinugator are both battery powered; the NeilMed Sinus Rinser and the Squip Injector System are manually powered; and the SinuPulse is electric-powered (120 V). If you need a portable nasal irrigation system, we'd recommend checking out the NeilMed Sinus Rinse. For chronic conditions, it might be worth investing in a standalone irrigation system like the Navage or the SinuPulse. Remember to always consult with a physician regarding their use. The Navage ships with 60 SaltPod Capsules and a countertop caddy. It's powered by an included pair of AA batteries. The Navage functions as a 'nasal irrigator', providing gentle powered suction. The proprietary SaltPods are saline decongestants that help gently relieve sinus congestion. 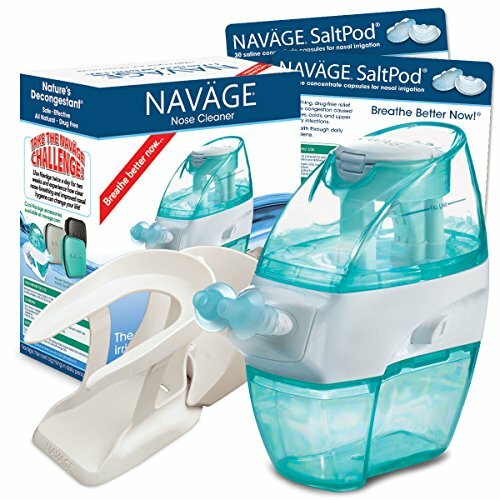 It will ONLY work with Navage SaltPods- so you should load up on them, or choose a different unit if you don't want to be locked into that purchase obligation. It's particularly marketed towards people suffering from sinusitis, allergies, common colds & flues, hay fever (Source). One buyer told us that they have suffered from chronic congestion they had been treating with oral steroids. Netti pots had stopped being effective and when the oral steroids wore off his nasal passages were nearly totally blocked. They bought this battery-powered irrigation kit and told us that its mild suction gently irrigated his nostrils throughout its tight, blocked crevices, clearing out seemingly intractable blockages. The best part about it, they told us, is that the machine closes off both nostrils so that the saline solution doesn't back out of your nose instead of through the passages. This nasal irrigation kit offered by Naväge is a good option for someone who needs a nasal irrigator with a gentle powered suction. Users love the functionality of this nose cleaner, but do complain about the fact that it works only with expensive original Naväge salt pods. This product is a natural decongestant and it is clinically proven to relieve congestion due to allergies, sinusitis, hay fever, common cold, dry air, pollution, etc. It features a nose cleaner, 60 SaltPod® capsules and a countertop caddy. Naväge nose cleaner is completely self-contained which is great because you can use it fully clothed without making a mess. 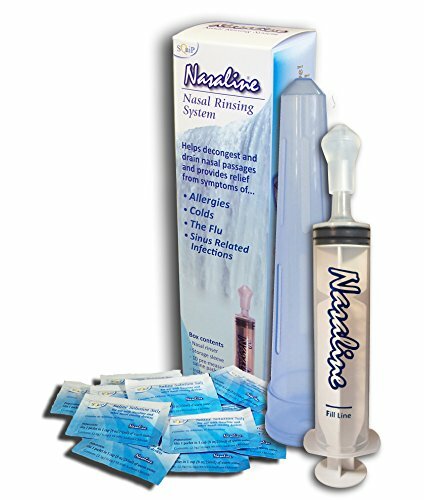 This nasal rinserseems like a good choice if you are looking for a convenient nasal irrigator that uses gentle suction. The general user consensus concerning the Naväge nasal irrigation system is that it works great for relieving sinus problems and is well worth every penny. Buyers are overall satisfied with the suction feature since it prevents the solution from going down the throat. However, some buyers complain about the cost of the salt pods and the fact that this nasal irrigator kit can be used only with those purchased from Naväge. One dissatisfied purchaser shares that several mechanisms have been built within this machine to prevent it from working unless you have installed a fresh Naväge pod into the device. This nasal sinus irrigation system offered by Health Solutions is a good option for someone who needs a decongestant that will provide sinus relief in less than a minute. Users love the effectiveness of this nasal rinser, but some do complain about the quality. This product features a patented SinuMist function which is great because it can deliver both a gentle pulsating mist spray for soothing relief and also a more thorough pulsating rinse to cleanse the sinuses. This nasal irrigation kit has a clog-free leak resistant design with LED display. This sinus rinse system might be a good choice if you are looking for a nasal rinser with fully adjustable pressure control. In general, users have a favorable opinion of the Health Solutions nose and sinuses cleaner, saying that it is an excellent and effective sinus irrigation product. One happy purchaser says that it works much better than many other nasal rinsers available on the market due to the pulsate technology. Another one states that the water pressure is great. However, some buyers complain about the quality of the item. Several dissatisfied buyers share that they experienced water leakage since the water tank seal is a bit poor. One buyer complains about the connection between the base and the water tank being poorly designed. 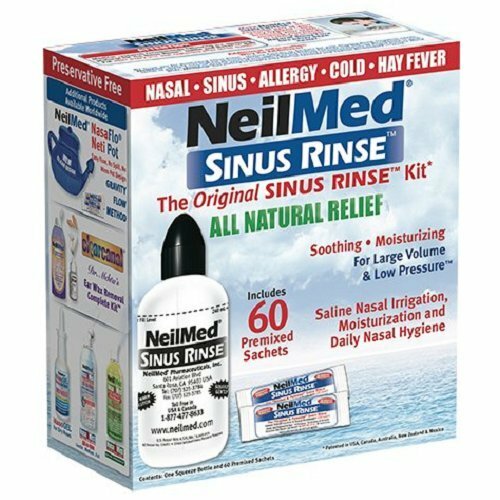 This sinus rinse kit offered by Sinus Rinse is a good option for those who need a simple yet effective nasal irrigation set. Users love the simplicity and effectiveness of this nasal rinser, but some do complain about the wrong description of the product which suggests receiving a bottle that they didn’t actually get. This product is a large volume and low-pressure saline nasal irrigation and moisturizing system. The kit includes 50 packets of easy to dispense USP grade preservative, iodine or latex free sodium chloride and sodium bicarbonate mixture. The solution is soothing, pH balanced and isotonic which is great since it causes no burning or stinging. If you are looking for an inexpensive nasal irrigation set, this might be a good option. 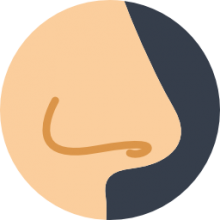 In general, users have a favorable opinion of this nose cleaner and they state it is very simple to use and easy to clean. One satisfied purchaser says that this package represents a great value since you get the bottle and a large number of sachets. However, several purchasers are dissatisfied because they didn’t receive the bottle but only sachets. If you are looking for a top-rated nose cleaner, you might want to consider this nasal rinsing system offered by Squip. Users like its simplicity and compactness, but some do complain about the quality and durability this item. This product is a syringe delivery system which allows a user to control the flow and pressure of the saline solution for optimum comfort and effectiveness. It features a silicone tip/applicator to allow for an easy and gentle rinsing experience. The Squip nasal rinser is designed to protect against backflow. This nasal irrigation kit could be a good choice if you are looking for an inexpensive nasal injector. In general, buyers are satisfied with the effectiveness and slim design of the Squip nasal syringe.One satisfied user says that it is well worth the price. Another one shares that what she loves about the syringe is that it allows full control of the water pressure. The reviewer adds that the rubber tip fits comfortably in a nostril. However, several buyers complain about the quality and durability of this nasal rinser. One dissatisfied purchaser says that the plunger gets tighter and tighter which results in a purchase of a new syringe every 4-5 months. Another one complains about the plunger being very tight, to the point where a lot of force to draw water in and then squirt it out is needed. 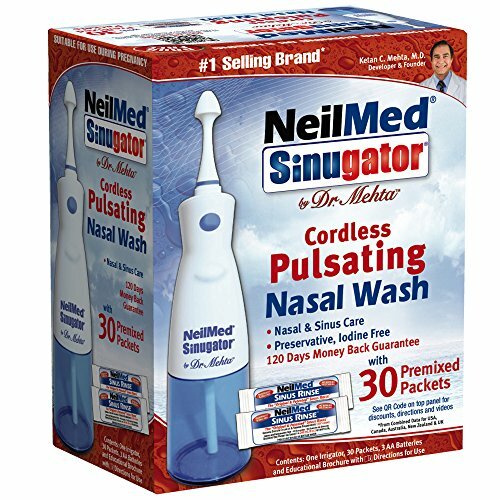 If you are looking for a sinugator, you might want to consider this cordless pulsating nasal wash offered by NeilMed. Users love that it does the job well and is easy to use, but do complain about poor quality. This product is a large volume and low-pressure system for saline nasal irrigation, moisturization and daily nasal hygiene. It comes with 30 premixed packets of USP grade preservative, iodine and latex free sodium chloride and sodium bicarbonate mixture. If you are looking fora long-lasting high-quality nasal rinser, this might not be such a good option. In general, users have a favorable opinion of this Neil Medsinugator, and they praise its effectiveness, easiness of use and low price. However, some buyers complain about the cheap brittle plastic construction of the product which makes it last for only a few months before it breaks.On the other hand, one user says that durability shouldn’t be an issue since the product is cheap enough. The first nasal rinse system we examined was the Navage. It's marketed as one of the only nasal irrigators that has a truly gentle suction power that is designed to help relieve nasal congestion associated with hayfever, colds, pollution, sinusitis, and common allergies. A drug-free option, the manufacturers reinforce that nasal irrigation is an effective and safe means to disrupt sinus congestion so that you don't have to go to the doctor as frequently or take potentially harmful medications. The nose cleaner itself works only with Navage salt pods, helping you to retrieve refreshing saline rinses without a mess. Buyers say that this nasal rinse system will not function without the salt pods- this is because of their proprietary design. Other buyers also say that you should always use distilled water, regardless of the nasal-rinsing device you choose to purchase- this is because elements in tap water can create polyps, reviewers have been told by medical professionals. It's powered by a pair of included AA batteries- and if you use it twice a day, for irrigation cycles that last under 30 seconds, the batteries are indicated to last at least three months. Some buyers who traditionally used neti pots purchased this as-seen-on-TV nasal rinse system because it produces less of a mess and was more powerfully effective for relieving runny noses, seasonal allergies and clogged nose associated with common colds. Another purchaser who suffers from chronic sinus problems and who frequently resorted to over-the-counter nasal sprays, instead of neti pots, says that using the Navage twice a day has helped increase the quality of his sleep, decreased incidences of headaches, and liberated him from the nasal sprays he had been relying on. In addition, buyers say that it's a worthwhile investment to buy saline pods in bulk so that you never run out- you can also supplement with a travel case and a drying rack. Another sufferer who has had such serious nasal congestion issues since childhood that it required oral steroids to relieve says that the nasal rinse machine has actually opened up his right nostril passage that often times became completely closed. One of the best features of this machine is that it closes off both of your nasal passages so that the rinsing solution doesn't leak back out of your nostrils- plus the gentle suction helps to permeate through really tight areas. The second nasal irrigation system we examined was manufactured by Health Solutions- it's marketed as a quick sinus relief option that includes an integrated LED display and an adjustable pressure control. It's marketed as a high-tech irrigator that provides a pulsating spray for gentle relief to help clear and clean the nasal cilia and sinuses. It's marketed to individuals suffering from sinus infections, postnasal drip, sinus headaches, congestion and inflamed nasal passages. A drug-free treatment option, they describe the origins of nasal irrigation as beginning in ancient India when sufferers would frequently resort to manually sniffing up salt water to clear out Weed, tree, flower and grass pollens that had accumulated in the nose. This helps to purge the sufferer's nose of inflammatory irritants that were to blame for the aggravating sinus and allergy symptoms. Some buyers say that the key to success using an irrigator is the amount of fluid flushing it provides in conjunction with the steroids that can be added and its adjustable pressure. These all operate in tandem to provide the best long-term results. Another reviewer who suffers from aggravating post nasal drip told us that he was so frequently stuffed up with phlegm that he would constantly be coughing mucous up throughout the workday. In addition, because of this chronic nasal aggravation, he was on able to get a full night's rest, which had negative effects on his job performance as well as his general mood. Most buyers find that it is a stellar complementary therapeutic device that has been able to provide targeted rinses with a durable motor built to stand up to the corrosive elements of the saline. The third nasal rinse we examined is not a machine- instead, it is 50 premixed packets that provide a sinus rinse to alleviate dryness, allergies as well as relief of irritation associated with occupational dust, pollen, smoke, animal dander and other noxious fumes. It ships with the bottle and 50 saline packets with buyers saying it's a good idea to watch a couple of YouTube videos to get a sense of how to best use this option. One buyer who has suffered from chronic sinus infections that even impacted his teeth told us that for him it was a miracle cure, dislodging a disgusting amount of mucus from his nose, relieving sinus pressure and enabling him to breathe comfortably again. Buyers say that in order to get the best results, you should try to aim is nozzle tip of your opposite eye rather than inject the bottle nasal rinse straight vertical into the nostril. The fourth nasal rinsing system we examined is the Squip system. This is a syringe delivery system designed enabling you to completely control the pressure and flow of the saline solution to maximize its effectiveness and comfort. As well, it is built to avoid as much as possible the incidence of backflow so that reinfections don't occur. Buyers say that it is an effective option that is a solid solution if you need to travel with a nasal irrigation tool. One common complaint is that if you are using it frequently the plunger can become intractable in under half a years time. Another buyer told us that in comparison to electric-powered machines, it's much cheaper with comparable performance plus it's better than a regular Netti pot because you don't have to tilt your head. The last nasal sinugator we examined is built by NeliMed. It is a cordless, battery-powered option that provides a pulsating nasal wash helpful for cleansing the nostrils before you spray nasal corticosteroids. Buyers say that opposed to bulkier machine options, this nasal irrigator is a small and portable option that is a great travel accessory. Another reviewer who is plagued by congested airways on account of horrific allergies says that as an active parent it was essential that she find a solution that would help her sleep through the night and deal with her overactive seven-year-old at home. She told us that she employed bottled water as opposed to tap water to ensure that there weren't any disgusting amoebas that would be infecting her nostrils. The result was she unearthed disgusting mucus chunks from her nose that were so massive that she couldn't believe they came from her face. If you have to use it frequently, buyers suggest purchasing a nasal gel to help soothe the nasal tissues that become over washed.